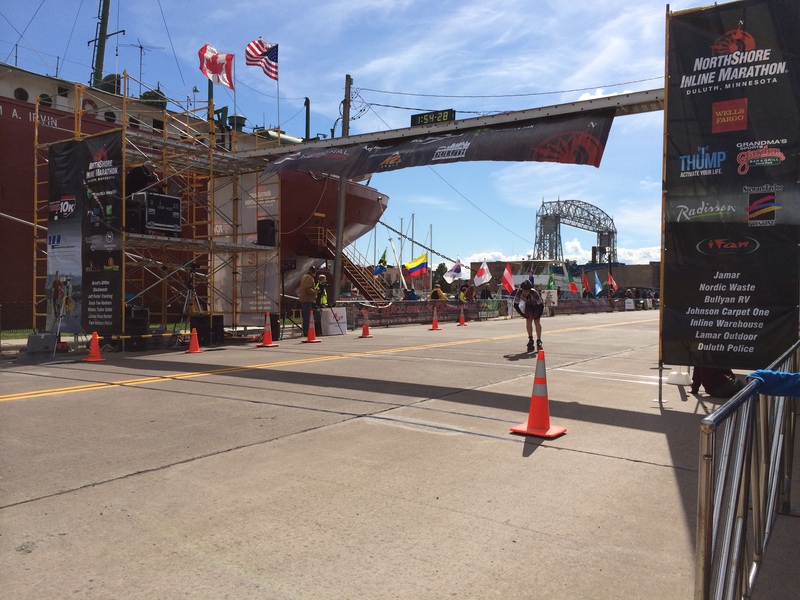 This year’s NorthShore Inline Marathon took place on September 13, 2014. I have been on the fence about how to approach this race report. I have been training hard, tweaking work outs and spending a lot of time on skates, doing intervals, adding volume, and generally trying to train as hard as I can. The hope was I would move up to Advanced Wave 1 from Advanced Wave 2, where I raced last year. A lot has happened in the last year, and I registered early in 2014, not thinking I would be able to move up and stick with the guys in Advanced Wave 1. Then, the first race of 2014, I stuck with the lead pack all the way through the race. I also had a top 5 finish at the MN Half in August. This ultimately lead me to sign up for Advanced Wave 1, moving from Advanced Wave 2, because most of the guys I have been skating with all year were planning on racing that wave. My thought after the move was simply “I hope I can keep up.” This mindset provided one of the very important lessons for me for this year’s NorthShore. So I moved up a wave, and I increased some of the intensity of my training, working on getting my average solo pace up to around 16 miles per hour on my “slow” wheels and bearings that I spent the summer skating. My last training session was, basically, as planned, at the end of three days of increasingly intense tempo and distance skates including one of my usual hill routes. This trip was, basically, my typical volume trail skate, but I only went 15 miles, and the pace wasn’t ridiculous, but for a typically unruly trail after some rain earlier in the week, I was happy with the pace. When I got home, though, my legs were totally dead, and I felt like I could barely stand up for about an hour. I actually spent much of that hour eating a little here and there and sitting, because my legs, and really the rest of me, felt so exhausted. This should have been a warning. The following Monday, I woke up with head congestion and a sore throat, the sound indicators of a looming head cold. That head cold turned into some ugly chest congestion, and my attempts to ward off the illness with Zinc supplements and sleep didn’t save me from a wet, chesty, cough that persisted through the remainder of the week and into the morning of the race. Basically, I skated the NorthShore this year with one of the worst chest colds I can remember. In fact, a week after the race, I am still struggling to overcome whatever this bug is, and I really hope to get over it soon. Before race day, I had been watching the weather. Friday, the weather said we could look forward to start time temps around 40 degrees, with a 5 mile per hour WSW wind. That WSW wind is, unfortunately, a headwind on the NorthShore course, as the course travels South from Two Harbors to Duluth, Minnesota in a Southwest direction. Still, 5 mile per hour winds aren’t much to worry about. However the forecast did call for an increase in the winds to 10 miles per hour through the morning, which meant skating into a wind that would be getting stronger the closer we got to the finish. Not the best conditions, but certainly not the kind of wind we fought in 2013. The morning of the race, my wife dropped me off at the bus stop to the start line around 7 AM. My race was scheduled to start at 9:35, but I didn’t want to be rushed getting ready for the race like I have for just about every other race, especially Roll for the Roses, this year. The bus I happened to board was the first bus for the full marathon event, and included most of the roller-ski competitors who were scheduled to push off at 8:30. I was very early, and it was pretty cold, but it certainly wasn’t the end of the world, as I had plenty of time to jog a bit, catch up with some other skaters, find some of my Team Rainbo teammates, and get my gear on for the race. We lined up at the start line in time to see the Elite Women take the course. After a 5 minute wait that felt like forever, the horn sounded, and Advanced Wave 1 was on the course. The start of this race is notoriously down hill, though not in the sense that it is steep, but just that the grade decreases over the first couple of miles. It was a fast start, as I expected, and it took about a mile before the pace line really started to form. I spent a lot of time trying to position myself well in the pack and not waste a lot of energy, as I couldn’t breathe very well with my chest cold. From that point, I felt the race was pretty predictable. Lots of little attacks here and there, but nothing really significant happening. About 7 miles in, I started to get tired, and as the line flexed and compressed going up and down the rolling hills on the course, the line began to accordion. This lead to a lot of sprinting on my part, and reminded me of the all the interval work I spent doing getting ready for the race. Right around mile 9, we had the first, and thankfully the only, crash in the line. I am not clear on what happened, but what I saw were flailing limbs all over and the line exploding with people jumping and weaving to get out of the way of the tumbling bodies in the path of the skaters toward the back of the line. I managed to avoid the carnage, and kept skating with the main pack, though a couple of skaters had broken away from the main group and were opening a gap on the pack. I continued to struggle with the accordion of the line until just short of mile 12, where my chest congestion and poor mental state got the best of me. At that point, I couldn’t close a gap, and the main pack of Advanced Wave 1 skated away from me. The rest of the race was pretty boring, and if you are watching the video below, feel free to stop watching the video after the first 42 minutes. That covers the first half of the race, and most of the racing action I was able to capture. I spent most of the rest of the race skating alone, though did manage to hang with a group for a little while after I lost the main pack, and picked up another group with about 5 miles remaining, that I lost headed up Lemon Drop Hill just before taking the entry ramp onto I35. From that point, I skated with an acquaintance of mine, Pat Stream, through the end of the race. My helmet camera died shortly after we got onto I35, as I started recording far too early thinking I would be finishing the race faster. As a result, I wasn’t able to film the last 3 miles, or so, of the race. The only real highlights from that period were the finish and being passed by the leaders of the Combined Wave (they skate the Half Marathon early in the morning, and skate the full marathon starting after Advanced Wave 3), who passed us like a freight train yelling “Pineapple!” as they went by. This was something that Pat and the leader of that group joked about the night before the race. I crossed the finish line with a harsh burning in my chest, exhausted, and ready to take a nap. My official finish time was 1:34:26, I finished 10th in my age group (men 30-34), at an average pace of 16.7 miles per hour, much of which was set in the first half of the race, as the average pace for the first half of the race was nearly 20 miles per hour. In looking at my heart rate data from my Garmin, my average heart rate was 159, and once it went up, it never really came down. I spent a lot of time in high Zone 4, and, even when skating on my own, never really allowed my heart rate to even out. I think a big part of this was due to my chest congestion, which prevented me from getting good steady oxygen intake. While I was in the best physical condition I could have been in for this race, having a chest cold held me back. Looking back on this race, I learned a lot. My plan was to skate in the middle of the pack of possible to avoid the accordion effect that happens at the back of the pack. I didn’t skate aggressively enough for that to happen. Lesson number one, that I think applies to all of my races this year, is to be more aggressive in the pack. Lesson number two is that I can skate with the guys in Advanced Wave 1, even though I had doubts that I would be able to keep pace, absent a chest cold and skating more aggressively in the pack, I think a better mental and tactical approach to this race would see me keeping pace through the final sprint. My head wasn’t in the right place for this race, something that probably doomed my Chicagoland race this year, too. Lesson number three, I need to continue to work on my technique. I noticed that my heel was bouncing in the back of my boot while skating in the pace line, which is a strong indication my technique wasn’t consistent, and meant I was losing power in the push. This will continue to be something to work on in the future. I am a bit late with this report, but better late than never. The 2013 NorthShore Inline Marathon took place on September 14, 2013. This race is broken down into waves based on historical finish times. The Elite groups, basically the pro skaters, go out before the advanced groups. The advanced groups are broken into waves based on specific finish times. This year, they separated the usual two advanced waves into four, A1-2 and B1-2, based on times from previous years. The 2012 times that qualified skaters for Wave A2 were between 1:17:00 and 1:19:00. When considering those who I regularly skate with and where they skated in 2012, I opted to sign up for Wave A2, and have previously commented on whether I would be able to keep up. That pace is much faster than I had ever skated, but wasn’t far off the pace I managed to keep at the 2013 Minnesota Half Marathon. Thankfully, since last year and the addition of the “Wheels Off” Half Marathon Running event, the full marathon race starts much later than it used to. Rather that starting the race at 6 or 7 AM, the Elite group did not cross the start line until 9:30. That put Wave A2 at the start at 10 AM. I got a little bit better sleep before the race, and had a decent breakfast. My wife dropped me off to catch the buss to the start at just after 7 AM. I managed to get on the second bus to the start line. One of the guys I skate with here in Rochester was on the same bus, so we sat together and talked racing, off-season training, and the like. It was a fun ride, and, as per usual, it took about 30 minutes. We arrived at the start area about 7:30, 2 hours before the first wave was scheduled to start. I caught up with some teammates from Chicago, got ready to skate, and did the usual pre-race dance. They played the national anthem, and the first waves moved onto the course. I moved into the starting corral to get ready for the race. I got to the start line in time to see the Elite Veterans, Elite Women, and Wave A1 take the course. The waves were started about five minutes apart. Up until standing at the starting line, the weather conditions felt ideal. The temperature was between 55 and 65 degrees Fahrenheit, and you couldn’t feel the wind. We milled about and talked and joked with one another in the starting corral waiting for our race. That five minutes felt like an eternity. The announcer kept giving us tidbits of useless trivia during the wait. Eventually, we got to the the time for the race start. The start horn sounded and we were off. Tactically, I knew I wanted to stay with the front group in the wave, but I didn’t want to be so far in front that I got stuck leading early. This was the lesson I learned at the Chicagoland, where I came out too fast and couldn’t stay with the pack after 7 miles. However, I didn’t want to get caught in the accordion of the pack, get gapped, and lose the pack as a result, a lesson that has stuck around from when I skated this race in 2011. Out of the gate, the pace jumped to 18+ miles per hour. However, it didn’t take long for the wind to become a factor. A group of about 8 guys lead out, and while I started farther back in the pack, we quickly moved up. Shortly after the lines started to form we noticed this group of guys was getting away, so one of my teammates and I chased them down and bridged the gap between lines. Shortly after this move, we got an attack from the group behind us. We moved back and forth between lines until it really became clear the wind was going to be an equalizing factor in the race. I stayed toward the front of the lead group, which means I had to take my turn pulling the line. I pulled three or four times throughout the race, but generally managed to stay with the front of the pack. The wind really was the story this year. We skated right into a headwind that was a steady 15 miles per hour with gusts upwards of 20+ miles per hour. This really slowed the pace of the race. We went from what should have been a 19-20 mph pace to a 16 mph pace. At times, the pace felt downright slow, with some of the hill climbs slowing us down to 12-13 mph. The slowed pace meant a longer time skating on the rough pavement, resulting in more fatigued legs. It took 47 minutes to finish the first half marathon. Right around the half marathon point, my left calf started to cramp. I managed to stay in the line and work it out by changing up my technique. I moved farther back in the pace line to give my legs a chance to rest. However, the line cycled through 15 people deep in the line and it was my turn to pull again. I was fine generally while pulling the line, but couldn’t really keep the pace up. When I stopped pulling my legs locked up and it nearly put me on the ground. This happened a couple of times. Going into the end of the race, we hit the subdivisions leading up to Lemon Drop hill that takes us out on to I35, I knew my legs were going to be a factor because of the cramping and lack of push power. I worked in the line to get as much recovery as I could. We hit the hill and I had nothing in my push. I managed to stay with the group as my teammate John went on a flier up the hill. He took the pack with him, and I ended up at the back of the group when we crested the hill. The conditions on I35 generally don’t bother me. The road is grooved vertically, so there are equally spaced ruts all across the roadway going with the direction of travel. I capitalized on my ability to build speed on hills going down the on-ramp onto I35. I managed to catch the lead group and moved up far enough to be within 10 people from the front. I managed to cruise down I35 and keep pace with the front of the pack reasonably well. I knew, though, that the climb up the exit ramp onto 5th Avenue would present the same challenge as the climb up Lemon Drop hill. Sure enough, the pack went by me on the hill, and I managed to crest the hill with just enough strength to get down the hill headed toward the last left turn into the final straight away to the finish at the DECC. I wasn’t able to catch the lead group as I didn’t have the strength in my legs to push hard, and catch up. I was also working alone, which didn’t help either. However, I finished about 30 seconds behind the front group, and still had a pretty good race overall given the wind and fighting leg cramps. Overall, I had a solid result. I finished 4th in my age group, just missing the podium for the 30-34 group, and finished 41st overall for the non-pro skaters. There were a lot of lessons to learn from this race. There are two that I am taking with me going forward as general lessons for skating and racing. First, diet continues to be key, and I will continue to work on finding the right balance to make sure my body has what it needs for race day and avoid the cramps that nearly ended my race. Second, The time doesn’t matter, it is who you finish with. My 1:37:00 finish time was slower than my first result at this race, but I finished with, or close to, the top guys in my wave, meaning I am on their level as a skater regardless of the finish time. In training to race, the focus is now on raising my level of fitness for race day to finish with the top guys, and I am not as worried about times, other than to track general benchmarks for myself. My helmet camera video follows. You will want to turn the volume down as the audio is mostly wind noise. Also, I added two new gauges, one for last mile time in seconds and one for average speed, to provide a little more context to the race. Training during a taper week always feels like a no-no. However, I feel like you have to do something to keep moving or lose all of the progress that has been made since the start of the season. It is an odd feeling to be sure, because, at this point, I should be in the best shape of the season. I think my race times this year have been somewhat contradictory to that point, as Chicagoland was quite a bit slower than Roller-Dome, and the pace I managed at the Minnesota Half was beyond what I hoped to do after Chicagoland. Regardless, in the vein of thinking it is good to keep moving, even during a rest week, I skated last night. It was a quick 8 miles, partly to break in the cleaned bearings and get back on race wheels. The Adam’s Swiss I have been using still do very well when clean and lubricated with Bones Speed Cream and Gun Oil, and don’t seem to be showing their age as much as I expect. I am considering going back to Twin Cam ILQ bearings in my next switch, though, and lubricating them with Twin Cam T-Gel because I am very familiar with how durable those bearings are and they are very consistent in capability. The average pace for the skate yesterday was only 15 miles per hour, but I wasn’t looking to push the pace more than necessary to make sure I am recovered for the race on Saturday. I don’t know whether I will work out tonight, but if I do, it will be some light cycling just to keep the blood flowing in my legs. Either way, I am looking forward to the race this weekend. I should have video and a race report next week. At this point, it is 10 days to the Northshore Inline Marathon. I don’t know how to feel going into this race. My training has been hit or miss lately, but what I do get in focuses on speed. Labor day weekend, I put in some decent miles Friday, 20 miles Saturday, took Sunday off, and put in another 22 miles on Monday. All told, it was 50 miles for the long weekend. It felt good to be on skates that much. I have been adjusting my boots some, as the navicular bone on my left foot has been causing problems and my forefoot still feels smashed in the front of the boot. I also adjusted my frames. The adjusted the frames, also, because I noticed I wasn’t landing on top of my wheels when recovering during the push when I was tired. The frame placement has helped me skate better overall, not just when I am tired. My average speeds have been steadily increasing. Last night, I went out for a tempo skate. My tempos had previously been smashing my goal of a 15 mile per hour average speed. It wasn’t really pushing me. I upped the pace to 16 miles per hour, and that was quite a bit more difficult. This is the kind of tempo skating I should have been doing in June. I know better now going into the off-season as I start thinking about next year. It felt good to skate hard like that. I am hoping to skate intervals tonight, schedule permitting. While I haven’t been struggling with injury, this life transition has taken its toll mentally, physically, and emotionally. Skating is where I find peace in the craziness. I am looking forward to the race next weekend, but with trepidation at the end of the season, racing a course I haven’t been on in two years, and being in a wave that may be too fast for my ability. Ami the Writer summed it up in her post yesterday. Now is the final push, though. The taper really starts Monday after at least one long skate this weekend. Then the bike Tuesday, a skate Wednesday, rest Thursday, travel Friday, leading up to the race Saturday morning.